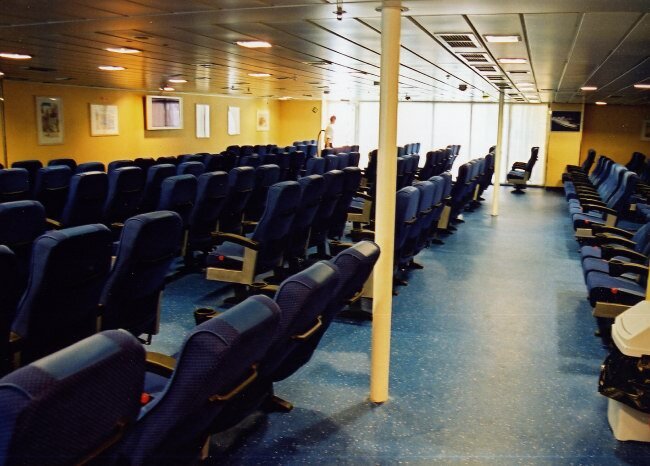 Above: Passengers as well as vehicles boarded the Alkmini A over her stern ramp, modified for use in an environment lacking the shore-based linkspans the Fantasia was designed to use in port. This is the view looking forward on the lower of the twin full freight decks, showing the ramp linking the two levels. 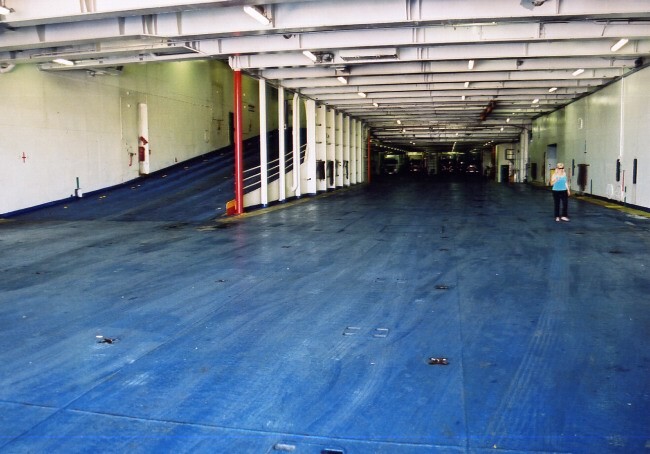 This ramp, which was retained by Sealink from the original freighter design, gave the ship an advantage compared to the P O Kent (ex-Spirit of Free Enterprise) which was displaced from the P&O fleet at the same time as the 'Canterbury' and was also eventually purchased by GA Ferries. The 'Kent' had independent freight decks with no linking ramp, loading being undertaken direct to the two levels at Dover and Calais. In the event, the latter ship (as Anthi Marina) had a similar ramp installed by GA prior to entering Greek service. Above and below: Forward of Silverstones was previously the large shopping centre. 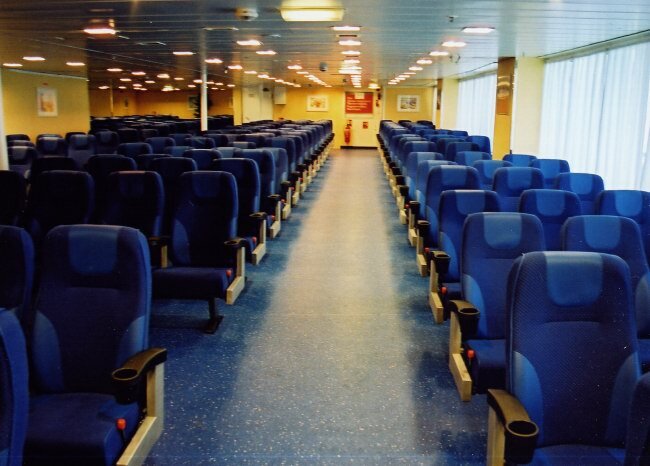 GA converted this almost entirely into a large reclining seat lounge other than a small outlet on the starboard side. 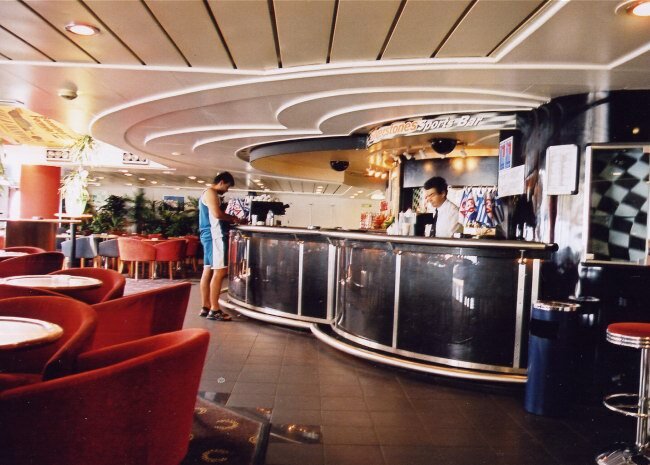 Above: The first passenger space on board the Alkmini A was Silverstones Sports Bar on the main passenger deck (Deck 7). 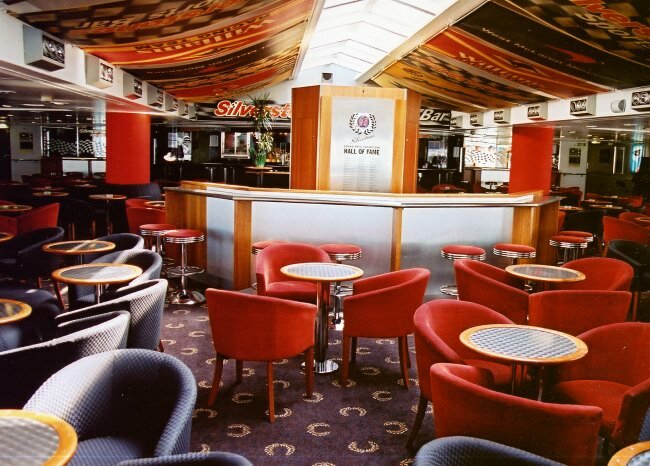 Installed at the outset of P&O Stena in 1998 (replacing the Stena Stingers brand which in turn had displaced the original and dramatically kitsch Samba Bar) Silverstones was barely changed by GA Ferries - the only significant alteration other than the addition of a variety of GA Ferries and Greek flags at the bar was the removal, presumably by P&O before sale, of the vintage model McLaren F1 car which previously hung from the deckhead beneath the skylight. Above: Looking across to starboard at the aft end of Silverstones. 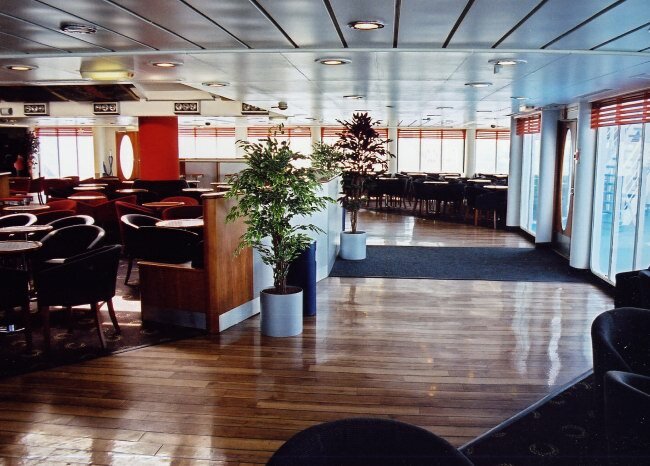 Other than GA's trademark potted plants, this view is otherwise a pure product of P&O Stena's original 'Brand World'. Above: The bar servery at the forward end of Silverstones. Of note here is the ceiling treatment, which mirrors the shape of the bar counter and, other than the structure of the room itself, is the only significant element of the original Fantasia decor remaining. 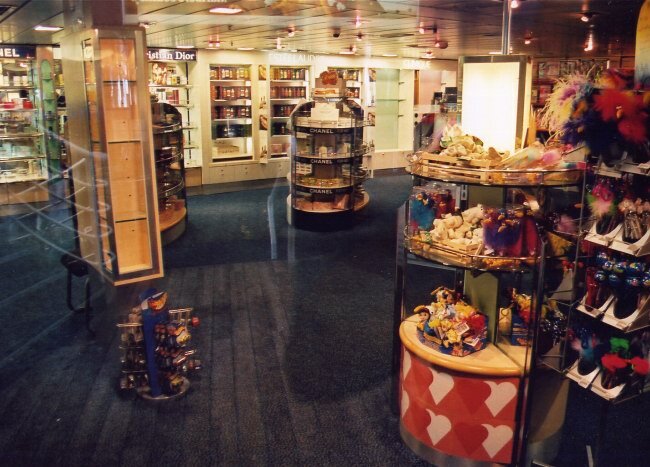 Above: The small shop which was retained on the forward starboard side of the reclining seat lounge. 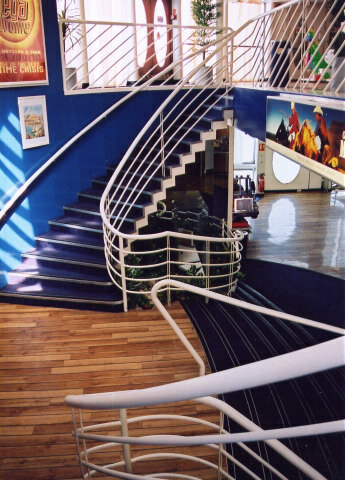 Above: The iconic staircase and lobby, largely unchanged from the original Fantasia design, were left intact in the ship's Alkmini A guise. This is the view looking aft and across to port. The forward entrance to the recliner lounge and the shop were up the first part of the staircase. 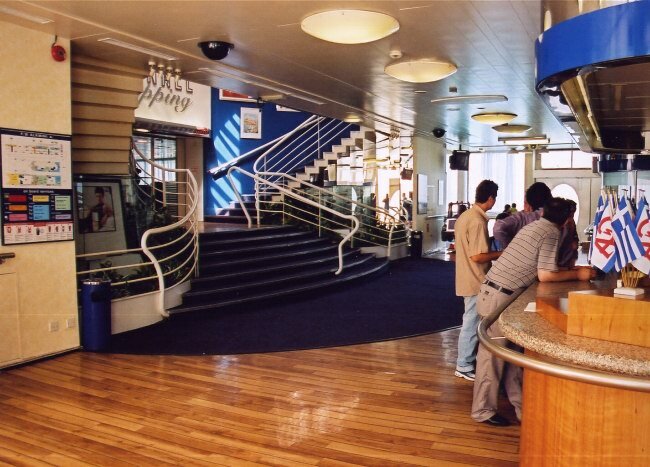 The large sign above their entrances retained the P&O Stena 'Channel Shopping' brand. Below: An overall view of the staircase which linked the upper and lower (main) lobbies.